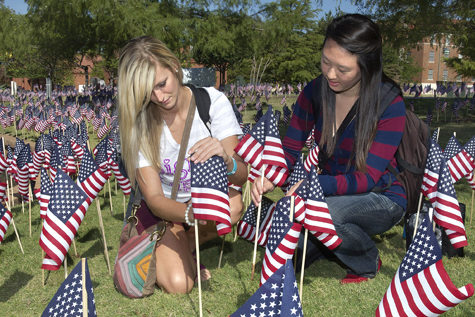 University of Central Oklahoma students Rachel Scott and Tracy Oh plant American flags in the ground by Broncho Lake as part of Central's 9/11 remembrance ceremony. Central students, faculty and staff planted 3,000 American flags on Central's campus during the service Sept. 9. OSU-Oklahoma City recently delivered more than 10 boxes of school supplies to Westwood Elementary School. The much-needed school supplies were donated by OSU-OKC staff, faculty and students. 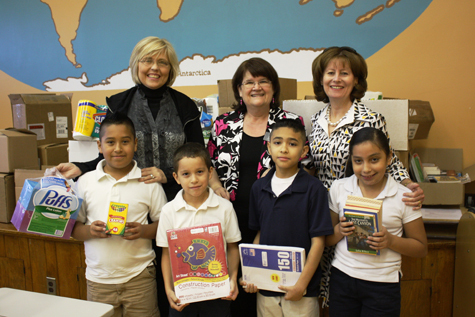 Pictured are Westwood Elementary School third-graders Jose Cruz, Cristian Nieto, Ismael Rojas and Lilyana Jaramillo displaying some of the supplies donated from the drive with Principal Susan Robertson, OSU-OKC Academic Affairs Administrative Assistant Janet Stricklin and OSU-OKC President Natalie Shirley. 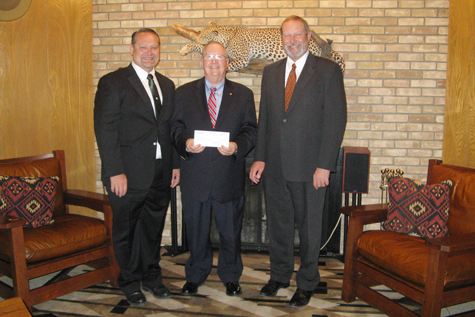 OPSU President Dave Bryant, center, recently accepted a $1 million check from Terry Stowers, left, and Douglas Burns on behalf of the Panhandle State Foundation. The largest donation in the history of the institution was made possible in part by the two Oklahoma attorneys.